You guys have probably seen that in our reviews, we try to go as in-depth as possible about all the features, specifics and details of hot smartphones like the Xperia Z2. Well, even though we tend to publish these notoriously lengthy reviews (the one of the Z2 is almost 30,000 characters! ), there's always a little something that remains left unsaid. jellmoo: When it comes to the camera, how does the speed compare to that of the Galaxy S5? From focus to capture, does it match the speed of the S5 and provide nice quality shots when doing so? Answer: It's safe to say that the Xperia Z2 matches the Galaxy S5 in terms of camera speed. We've measured that the S5 is ever so slightly faster to take a picture (2.5 sec for S5 vs 3 sec for Z2), but overall, the Z2 shouldn't feel slower. Furthermore, the synthetic benchmark application, Camspeed, returns a better result for the Z2 (452 score for Z2 vs 300 score for S5), so yeah, it should be able to at least match it. nudden: Im a z1 users for the period of 7 month, is it worth for me to upgrade to the z2? Answer: We believe this question isn't really so simple to answer, which is why you'd be better off if you go and check out our in-depth comparison featuring the Xperia Z2 and Xperia Z1! Getting to know the exact differences between the two will allow you to make a better decision. Supraman21: Is the battery life comparable to the Lg G2? Answer: The battery life with the Xperia Z2 should be even better than that of the G2, as suggested by our custom battery life test. In it, the Xperia Z2 has managed to last for the impressive 8h 10 min, while the LG G2 achieved the still-good, but not-quite-there 6h 48 min. That doesn't necessarily mean that the Z2 will last you longer than the G2, because that depends on a number of factors, but in general, yes, we expect Sony's flagship to exhibit better battery life. QuadFace: I like to listen to music using headphones, please tell me your opinion about sound quality if compared with the HTC One M8. Answer: There isn't such a great difference between the sound quality of the M8's pair of earphones and the one available with the Z2. Both sound quite good, with that of the One (M8) being a bit more punchy, with slightly less mid frequencies. 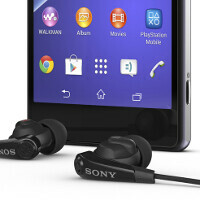 The earphones of the Xperia Z2 sound slightly fuller and flatter. You won't go wrong with either one. GreekGeek: How's the default screen calibration, warm or cool? Answer: The screen of the Xperia Z2 is more on the warmer side, considering the competition. The average screen temperature is about 6900 K, which means the Z2 will appear warmer than most high-end LCD screens currently on the market. rsiders: In manual mode in the camera, do users get control over shutter speed? Answer: Nope, you can't control shutter speed. sebas104: Does it record Full HD video at 60 fps? Answer: Sadly, no. The Xperia Z2 cannot record 1080p video at 60 fps out of the box. You can record 720p video at 120 fps though. shows that phone arena fanboyism is too damn strong perhaps? That's not their only fault. It DOES record 1080P @ 60fps! It has been fixed, thanks! Break time indeed. HOLY CRAP HE FIXED HIS POST ONLY TOOK HIM 6 HOURS. That is funny . god bless RAY S.
Ray S. was drunk at that time. Well that didn't answer my questions. And btw, why are you saying about S5 battery life when you should be telling Z2s battery life? maybe a simple mistake on his part. But the people love to laught at it. Hope the author sees the Error. It was funny i ve got take picture of this screenshot. lol CHECK YOUR ANSWERS before you Publish. Yeah, yesterday. And with the smartband! :) I absolutely love these!! I'm so glad you finally got your Z2 :D how do you like the smartband so far? I'm glad too the wait was so long :) I like it. It calculates your sleep very accurately. It shows how many minutes you were asleep, and how long of that time were you sleeping deeply and how long lightly. The calories and step calculations also seem to be quite accurate. I'm just waiting for a cycling mode to come into it. I guess one is coming. It sits very comfortably on your wrist. It's very light and the material is soft and not too slippery or sticky. But I'm not sure if I would pay that full 99 euros for it. I mean it's nice and I'll definitely use it since I have it now, but 99 euros is still a bit too much for it IMO. Yeah. I will buy the headphones though. Luckily they are just 50 euros and not 99 :) I'm still not sure whether to get the charging dock or not. I would kinda like it because I have docks for all my portable devices it's so easy to charge them like that! Just got my magnetic charging cable and it's pretty awesome. It's cheap on eBay and very useful. It's doesn't stay on the phone very well if you are trying to use your phone when they are connected. But great alternative of the dock. Looks quite handy indeed. But I think I would still prefer the dock. Bu the way, does the dock have a separate cable to plug into wall or is it connected to the normal charger?